Kirk Douglas Theatre, Culver City, Calif. Looking for a good play to see this weekend or next? Well, keep looking. Whatever it is, “Elephant Room” at the Kirk Douglas is definitely not a play. A skit? Maybe. Entertaining? Kind of. 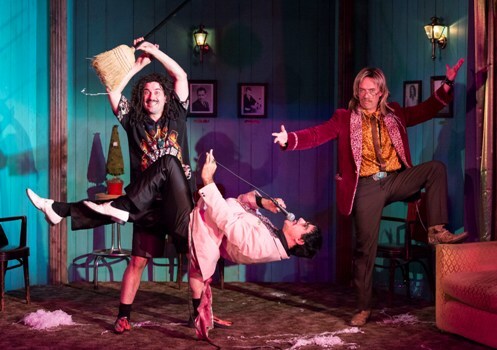 The best capsule explanation I can give is that there are these three guys, who look old enough to know better, romping onstage in leftover 1970s duds, performing some standard magic tricks and horsing around in a style reminiscent of a frat house. The setup is that these middle-aged guys, Daryl Hannah, Dennis Diamond, and Louie Magic, have been learning some magic, have fixed up a basement room in New Jersey, and have moved it across the U.S. to the Kirk Douglas. You know, the old basement family room: poorly painted plywood paneling, cheap fold-out futon, and some other odds and ends of furniture. You can almost smell the mold. Resplendent in their Aardvark clothes, they pull a beautiful young woman from the audience. It helps. They do their tricks in style … schleppy style, but style and competence nonetheless. That’s it, with some old rock tunes thrown in for atmosphere. Call me a curmudgeon. That is probably fair. My expectation, when I go to any of the Center Theatre Group stages, is that what I will see has a story arc, character development, hopefully something like a beginning, a middle, and an end. In “Elephant Room” those elements are missing, missing, and missing. Had I been a fan of “summer” entertainment, had I had a couple of drinks before, and maybe another in hand, then maybe … maybe I would have rolled with the punches and enjoyed. There were some in the audience who did.